Xenophobia is the unreasoned fear of that which is perceived to be foreign or strange. Xenophobia can manifest itself in many ways involving the relations and perceptions of an ingroup towards an outgroup, including a fear of losing identity, suspicion of its activities, aggression, and desire to eliminate its presence to secure a presumed purity. Xenophobia can also be exhibited in the form of an "uncritical exaltation of another culture" in which a culture is ascribed "an unreal, stereotyped and exotic quality". Vienna Declaration and Programme of Action urges all governments to take immediate measures and to develop strong policies to prevent and combat all forms and manifestations of racism, xenophobia or related intolerance, where necessary by enactment of appropriate legislation including penal measure. 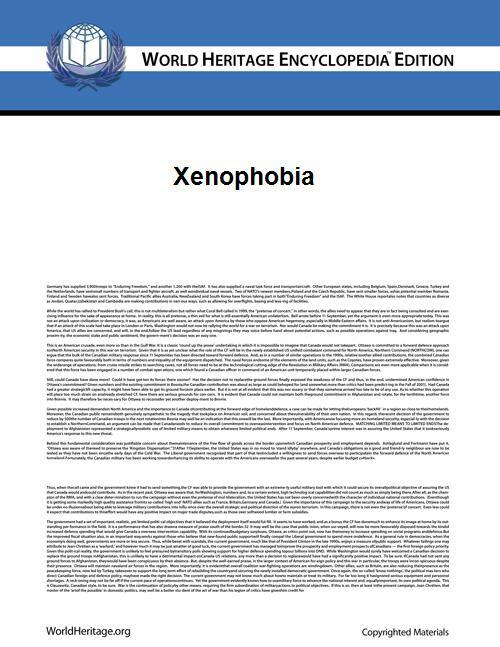 Dictionary definitions of xenophobia include: "deep-rooted, irrational hatred towards foreigners" (Oxford English Dictionary; OED), and "unreasonable fear or hatred of the unfamiliar" (Webster's). The word comes from the Greek words ξένος (xenos), meaning "strange", "foreigner", and φόβος (phobos), meaning "fear". The first is a population group present within a society that is not considered part of that society. Often they are recent immigrants, but xenophobia may be directed against a group which has been present for centuries, or became part of this society through conquest and territorial expansion. This form of xenophobia can elicit or facilitate hostile and violent reactions, such as mass expulsion of immigrants, pogroms or in other cases, genocide. The second form of xenophobia is primarily cultural, and the objects of the phobia are cultural elements which are considered alien. All cultures are subject to external influences, but cultural xenophobia is often narrowly directed, for instance, at foreign loan words in a national language. It rarely leads to aggression against individual persons, but can result in political campaigns for cultural or linguistic purification. In addition, entirely xenophobic societies tend not to be open to interactions from anything "outside" themselves, resulting in isolationism that can further increase xenophobia. A physically, emotional, or economically negative experience with a particular group which is then over-generalized to all members of that group. Classical conditioning, that is when someone is conditioned to having a fear or repulse from aliens generally, or, from specific group. Ways to instill it would be dehumanization, mostly by propaganda, for example: a video containing group members shown distorted, erroneous, and in proportional phases of horror sounding. Imitating others, mainly those that are close to the individual, or, in many cases, societal norms of a nation. ^ Guido Bolaffi. Dictionary of race, ethnicity and culture. SAGE Publications Ltd., 2003. Pp. 332.